As in 2010, A. mississippiensis met the criteria for high volume trade. EU imports principally comprised wild-sourced skins originating in the United States; a total of 287 650 skins were imported in 2011 (all sources). Imports of skins increased by 10% between 2010 and 2011. The species was reviewed for SRG 41 and a positive opinion was confirmed for the United States, the only range State, on 14/09/2007. 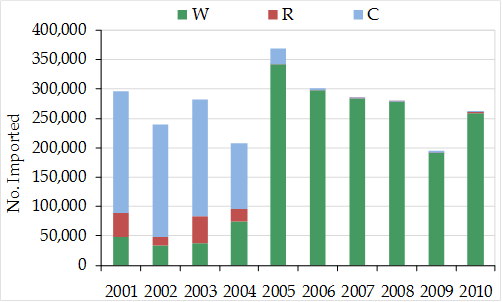 EU-reported imports of Alligator mississipiensis skins (excluding skins reported in kg) from the three main sources (‘W’, ‘C’ and ‘R’; ‘W’ includes ‘U’), all purposes, 2001-2010. In 2010, EU imports principally comprised wild-sourced skins (259,386 skins), with notable quantities of wild-sourced skin-pieces (3,199) and small leather products (2,629), the majority of which were traded for commercial purposes. Smaller quantities of skins originated from captive-bred and ranched sources (1,553 and 1,000 skins, respectively). Total imports of skins increased by 26% between 2009 and 2010, while imports of ranched skins in 2010 were at their highest level since 2004. All wild-sourced imports and the vast majority of ranched imports originated in the United States. The SRG reconfirmed a positive opinion for the United States on 14/09/2007.